> I’ll honestly say I wasn’t expecting this. After the way the Brewers played last night, I thought they were going to get owned by Bronson Arroyo, who usually has his way with us. But it was the complete opposite: the Brewers blew out the Reds, 8-1. 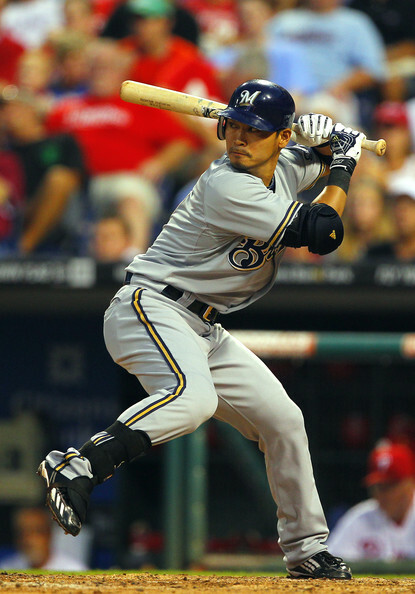 After Joey Votto put the Brewers in an early hole with an RBI double, the Brewers put up a huge two-out rally against Arroyo in the third, starting with a Norichika Aoki homer. Aramis Ramirez and Corey Hart also had RBI singles that inning. The Brewers scattered a few more runs through the rest of the game, including homers from Ryan Braun and Jonathan Lucroy. > I’m starting to notice a trend here. Adam McCalvy wrote today that the Brewers’ offense has been better without Prince Fielder. Doesn’t make any sense, right? But it’s actually become a theme now. The Brewers have played much, much better since trading away Zack Greinke. The Brewers played worse in 2008 after acquiring CC Sabathia (but you can’t argue with his numbers; obviously not his fault). As tough as it is to part with these star players, it’s hard to argue with the results following their departures. > Mike Fiers and Wily Peralta were scheduled for one and two more starts respectively, but Ron Roenicke said those plans are subject to change. > Shaun Marcum had his best start since coming off the disabled list, going six innings while giving up a run and striking out seven. > Aoki has the most extra-base hits (18) in baseball so far in September. > Aoki’s 36 doubles are the most ever by a Brewers rookie. > By the way, sorry for the brief articles lately. Schoolwork has really piled on much earlier than I expected, so that’s obviously my priority. > With their 4-2 loss to the Reds tonight, the Brewers are now 4.5 games behind the Wild Card leading Cardinals (after they finish taking out that one minor league team). In other words, the Brewers have dug themselves into a hole that almost requires them to win out and the Cards to lose out for the rest of the season, a very unlikely finish. Mike Fiers hasn’t been a very reliable option lately, and he got roughed up again tonight. The only two Brewers runs came on a Jean Segura RBI single in the fifth and Aramis Ramirez’s solo shot in the eighth. > Fiers is just collapsing. As I continue to preach, I hate the idea of completely shutting down a pitcher for the year, but Fiers is not doing a very good job of backing my opinion. After his incredible run to start off his big league career, he has done more than fall back to earth- he’s become an inconsistent option that isn’t giving the Brewers much of a chance to win. He’s certainly done enough to solidify his rotation spot for next year, but, if the Brewers do just miss the postseason, one of the flaws we’ll look back on is Fiers’ meltdown. > The Cardinals are currently beating the Astros, 4-0. We can safely assume they’ll lock that down, and then the Brewers will officially be 4.5 games back. > Since starting his career with a 1.80 ERA through 12 starts (plus one relief appearance), Fiers has a 6.70 ERA over his last nine games. His ERA has ballooned to 3.55 during that span. And it all started at that wretched Coors Field. > Norichika Aoki now has no hits in his last 13 at-bats. > Football season doesn’t officially start for me until after baseball season ends (and even then I’m usually paying more attention to the MLB offseason). 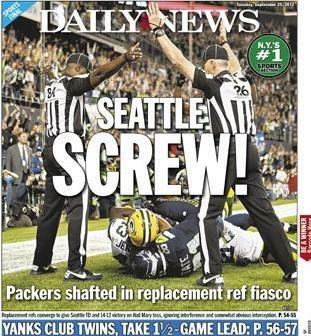 But even I was blowing up at this awful call during the Packers-Seahawks game last night. The replacement referees are starting to make MLB umpires look good. 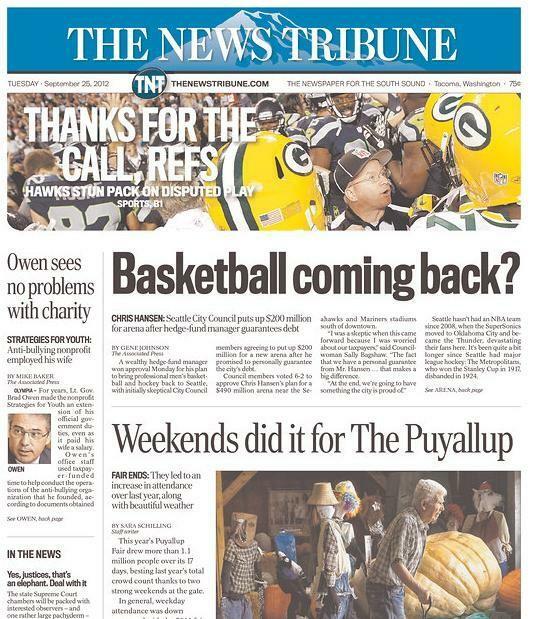 > After you watch that video, you’ll understand these headlines from this morning. > The Brewers did split this series, which is better than nothing against a team like the Nationals. But, considering the circumstances, they needed to do better; and it doesn’t help that both games they lost were complete blowouts. They were crushed today, 12-2. Marco Estrada proved he, for some reason, can’t pitch during noon games, and hammered for seven runs (six earned) in four innings against his former team. They Nats used both of their Z’s to kill the Brewers, with Jordan Zimmermann tossing 6 2/3 strong innings and Ryan Zimmerman hitting a three-run blast off Estrada. 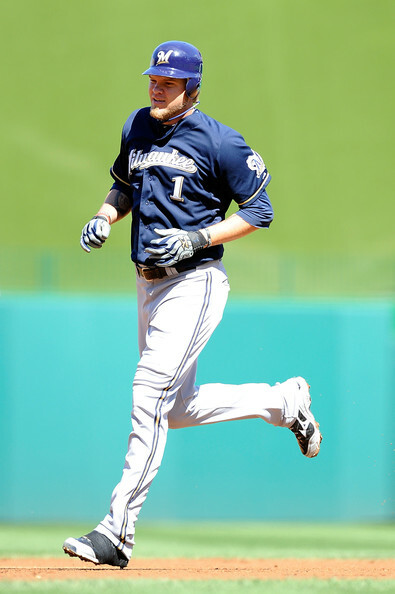 The Brewers only managed two runs, one coming on a Corey Hart homer. > Estrada had been able to avoid the big inning his last few starts, thus being able to go 4-1 with a 1.23 ERA in his six starts prior to this. But it came back to haunt him today. After getting two outs in the fourth, he allowed five consecutive baserunners, and that doomed the Brewers for the rest of the day. > The Cardinals took down the Astros, 6-1. The Brewers are now 3.5 games back with nine to go. It’s going to take a miracle- and probably a Cardinals collapse- to make it at this point. > Aramis Ramirez hit his 50th double of the season. > Norichika Aoki has no hits in his last nine at-bats. > Finally, a game I can enjoy covering. It’s been too long. The Brewers defeated the Reds somewhat handily today, 6-3. This snapped a three-game losing skid courtesy of the Cardinals, and was a strong start to an important series, even if the Brewers aren’t contending. I wasn’t high on Yovani Gallardo’s chances coming into tonight’s start. He had struggled his two starts before his last one, and, despite performing well in his last one, it came against the Astros. Plus, Yo has struggled against the Reds at Miller Park in his career. But, he jammed that down my throat with a great start, going seven innings while giving up a run on six hits. He walked three and struck out four. Gallardo had to dance around danger multiple times, but it was one of his better outings this year as far as pitching in the clutch. He improved to 10-8 on the year and his ERA fell to 3.79. Meanwhile, the offense backed him late. Early on, it looked like the Brewers were in for another rough go against Reds starter Bronson Arroyo. Coming into tonight, the Brewers at a .139 average against Arroyo in three games this year. That stat held true until the fifth inning, when the Brewers finally solved the puzzle. Martin Maldonado led off the inning with a double. After Jean Segura advanced him to third on a sacrifice fly (the throw actually hit Maldonado as he was sliding into third), Gallardo himself drove in the game’s first run. That was all the Brewers got that inning, but they added on massively later. The Brewers hit three home runs off Arroyo in the sixth inning, which is what they should be doing to him all the time. Aramis Ramirez, who had been barking with Arroyo earlier in the game due to some beef that goes back a ways, hammered his 14th home run of the season. Corey Hart followed that up with a mammoth shot into the Harley Davidson deck (if you know Miller Park’s geography you know that’s pretty far). Then, after a single by Rickie Weeks, Maldonado hit what appeared to be a routine fly ball off the bat, but it just kept carrying until it was a two-run homer. The only Reds tally came in the seventh on a Zack Cozart home run, which was the one blemish on Gallardo’s line. Then, in the eighth, the bullpen appeared to be having one of its classic meltdowns. Jay Bruce led off the inning with a single off Francisco Rodriguez. One batter later, Scott Rolen hit a ground-rule double that put men on second and third with one out. After K-Rod walked Todd Frazier to load the bases, Ron Roenicke opted to go to the Brewers’ other struggling closer, John Axford. Ax promptly gave up an RBI single to Xavier Paul. Then, the Brewers were given a dash of luck. On a 3-2 pitch to Dioner Navarro, he hit into the right center gap, and it looked like it was going to be a bases-clearing double. But, right fielder Norichika Aoki saved the game with a sliding catch, and it turned into a sacrifice fly for Navarro. Axford then induced a Cozart pop-out to end the threat. The Brewers tacked on one more on Maldonado’s RBI double in the bottom of the eighth. That allowed Axford to come back out for the ninth and record his first multi-inning save since 2010 (yes, all the way back to the Ken Macha era). > Segura made his anticipated Brewers debut tonight, batting eighth and playing shortstop. It didn’t go well, as he went 0-for-4 with two strikeouts. He saw eight pitches total, six of which were sliders that his nerves wouldn’t let him lay off of. He did have a productive at-bat to advance Maldo to third in the fifth, and he smashed a line drive to right field in the sixth, although Bruce had him played perfectly. Segura didn’t look bad defensively, though. I was worried he’d pull some Yuni B’s in his debut, but that didn’t happen, thankfully. I’m excited to see what Segura will do in the future for the Brewers. I have very high hopes for the kid who was the centerpiece of the Zack Greinke trade for the Brewers. > I forgot to mention this last night, but Jim Henderson finally gave up a run. His ERA is now 1.93. 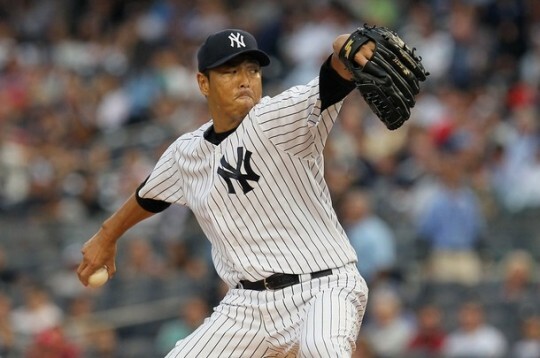 Despite the small sample size, I consider him the most reliable reliever in our bullpen. Had Axford blown it tonight, my theory of Henderson closing may have became a reality. > Shaun Marcum will make his first rehab start for Class A Wisconsin on Thursday, which will be the first step for his comeback. Once he comes back, he’ll basically be auditioning for the free agent market or a late August trade, though. > Cesar Izturis is headed to the Nationals, as he was claimed off waivers by them earlier today. That allowed the Brewers to call up Segura and get a look at him. Amazing how much formidable of a lineup that looks like without Cesar Izturis or Cody Ransom. > The Brewers called up Segura in an unexpected move today. Izturis was sent to the Nationals in a trade (they placed a waiver claim on him), so, in a corresponding move, they were able to give Segura a chance. The young shortstop hit .433 since being sent to Double-A Huntsville upon his acquisition, and his batting eighth tonight in his first start with the Brewers. > The Brewers just can’t seem to find a break in their schedule that will get them going. Ever since the All-Star break, they haven’t been able to match up against the tough opponents that have been thrown at them. After going 4-2 against the Pirates and Cardinals to start their post-ASB season, the Reds dealt them a crushing blow, basically sweeping the Brewers out of contention. Obviously, things haven’t gone well since. 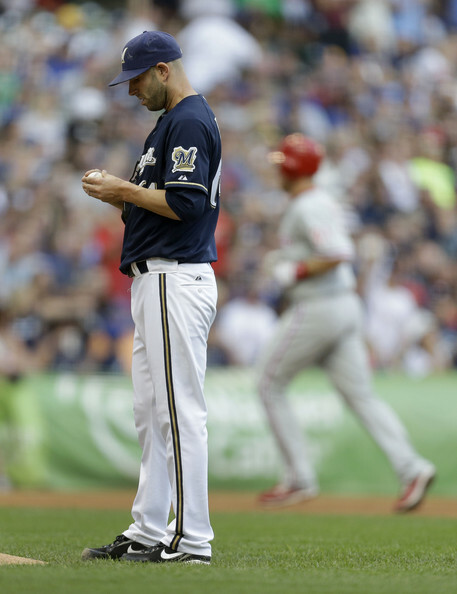 The Brewers were then swept by the Phillies in a series that should have been a sweep in the Brewers’ favor, but that series exposed how bad this bullpen truly is. Then the Nationals took three out of four from the Brewers at Miller Park. The Brewers followed that up with a three-game sweep of the Astros (who almost don’t even count as a team anymore), managing to put up enough offense that series to get around the horrible bullpen. But, after getting swept out of St. Louis last night, the Brewers find themselves 17.5 games out of the division leader Reds, 10.5 games behind the third place Cards, and 13 games out of the second Wild Card slot. The Brewers have yet to be mathematically eliminated (unlike the Astros), but any real chance of contending definitely diminished after this series in St. Louis. So, as Brewers fans, all we can hope for now is that the Brewers can just win some games and bring our spirits up, even if they aren’t in contention. That starts with a tough three-game series at home against the Reds, who have become the best team in baseball (66-42) after a recent hot stretch that included a 10-game winning streak (after which radio voice Marty Brennaman shaved his head). Anyway, tonight’s match-up is between Bronson Arroyo (7-6, 3.87 ERA) and Yovani Gallardo (9-8, 3.92 ERA). Arroyo is 13-8 with a 3.67 ERA in his career against the Brewers. The Brewers seemed to have Arroyo solved for a while, but he’s come back to once again make Brewers hitters look foolish this season. Gallardo, on the other hand, continues to be relatively inconsistent against the Reds. Over his past two starts against Cincy (both at Great American Ball Park), he’s 0-2 with a 4.63 ERA. As always, Jay Bruce, Ryan Ludwick, and Scott Rolen have given him trouble over that span. Thank goodness Joey Votto is on the disabled list right now. > Remember Yuniesky Betancourt? Of course you do. He was designated for assignment by the Royals yesterday after supposedly complaining about not getting enough playing time. It sounds like the Royals were going to give him a chance to stay had he been satisfied with less playing time so that younger players could get a shot, but Yuni wasn’t going to play that. Betancourt was struggling at the plate this season, hitting just .228 with seven home runs and 36 RBIs. He also missed 27 games in May, which didn’t help with that. Unfortunately, I wouldn’t be surprised to see Betancourt back in a Brewers uniform before too long. The Cody Ransom/Cesar Izturis platoon just isn’t getting it done offensively (although I have to say I like their defense most of the time). Even though recently-acquired Jean Segura has been tearing it up at Double-A Huntsville, the Brewers seem reluctant to call him up until rosters expand in September. So that leaves the shortstop position in the flux it’s been in all season. Which leads me to believe that Doug Melvin, who considered re-signing Betancourt last offseason as a utilityman, might go after him now. I’m not saying I’m in agreement with it (which I’m not), but don’t be surprised to see it happen. UPDATE: Never mind what I said about Segura. According to multiple sources, he’s been called up to the big leagues. Izturis is also reportedly heading to the Nationals. > Another ex-Brewer was also DFA’d yesterday in outfielder Tony Gwynn Jr. There’s no chance the Brewers pick him up, though, since they’re already stocked with outfield depth. Plus, Gwynn is really nothing more than a late-inning defensive replacement anyway. > Speaking of outfield depth, one Brewers outfielder seems to finally be reaching his potential: Carlos Gomez. He’s been tearing the cover off the ball lately, hitting .347 over his last 12 games. He has four home runs and 10 RBIs over that stretch. He also has five steals in that span, giving him 20 on the year, which is tied for 10th in the National League. If the Brewers can keep him going like this on a consistent basis, what a weapon Gomez would become. He’s always been considered a five-tool player, but only three of those tools appeared in his first few years in the big leagues- a cannon arm, stellar play in center field, and speed on the bases. In this stretch of games, the other two tools- hitting for both average and power- have finally shown themselves. I doubt Gomez will ever be a .300 hitter; I just can’t see it happening. But the power could be there to stick, which gives the lineup a huge boost. > And that’s about it. I’ll update with the probable lineups later, but for now, thanks for reading.